Hickory Glen will begin celebrating 30 years in the Springfield community on January 1st! We decided to share with you some of the History behind Hickory Glen. The vision began in 1981 when Edwina Kilbride and Mr. Leonard Sapp, at the time her sister and his mother were next door at Oak Terrace Health Care Center, decided it was time to build an apartment next to the Oak Terrace Nursing Home. The location was ideal due to the closeness to health care facilities, shopping centers, and parks. The vision was farfetched because of zoning difficulties, the approval of the Springfield City Council, and six houses had to be purchased for the vision to come to fruition. Mr. and Mrs. Sapp began their journey across the country, engaging in seminars and visiting other homes in Sun City, Washington D.C, Phoenix, Chicago and Florida. After four years of thorough planning, the ground work began in 1985. Mr. Rick Lawrence was hired as the superintendent, Mr. Sapp was his own subcontractor and Arlene Lilie was hired as the decorator. Mr. Sapp’s exquisite taste can be seen in the balconies, interior décor, lighting, large mirrors, safety installations, and amenities. Behind every great man is a woman and Mrs. Sapp, though not recognized, played a huge part in supporting and encouraging her husband’s vision. Oak Terrace wasn’t just a retirement home, it was “the retirement home.” The building opened to residents on January 5, 1987. In the summer of 2001, Oak Terrace was acquired by Everest Properties. A succinct transition occurred and Oak Terrace became HICKORY GLEN. Hickory Glen Active Senior Living transformed into what it is today—a magnificent blend of senior community living and prime independence with Mr. Sapp’s original vision in mind. What makes Hickory Glen different from a nursing home or assisted living facility? We are an independent living community that promotes activity, wellness, and engagement in our own community and in the greater Springfield community. Society has created a stereotype that all retirement communities are nursing homes where seniors are nearing the end of their lives… however Hickory Glen IS NOT anywhere close to this! Our community allows seniors to enjoy their golden years without having to deal with all the stresses that come with owning your own home. Our goal is to create a happy, warm, stress-free environment where seniors can socialize with each other and enjoy the hobbies that might have slipped away from them for one reason or another. Many times, seniors claim they aren’t ready for ‘this type of living’ and we are here to tell you that you are more ready than you think you are! We don’t want you to give up your independence whatsoever, rather we want you to be able to enjoy your time with your spouse, family, and/or your friends. 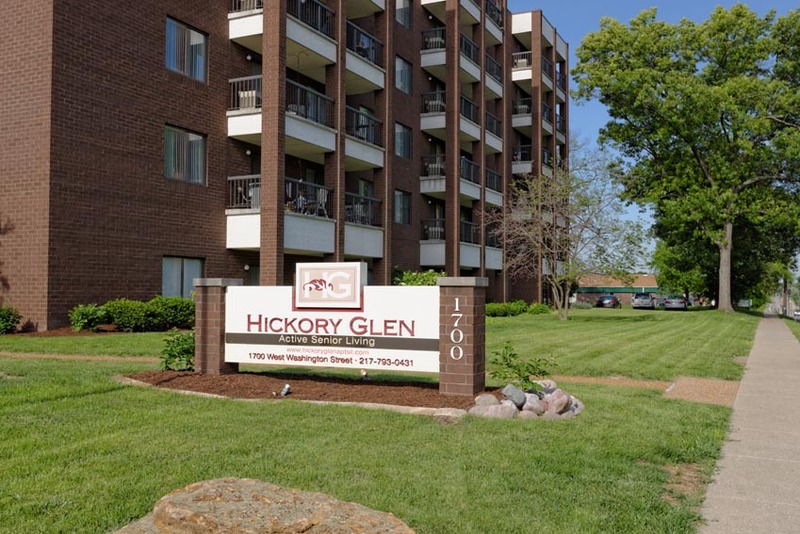 Hickory Glen encourages our residents to travel, volunteer, work, be spontaneous – our community isn’t here to hinder your dreams and goals… we’re here to help you make it all come true! Also, living in a community like ours will give your children and family members peace of mind knowing that you are living in a safe environment where someone can respond immediately if something were to happen in the middle of the night. Hickory Glen Active Senior Living encourages you to come visit our community before you make up your mind that you are not ready for this type of living. It may be exactly what you are looking for!